Happy Monday everyone! This morning I had to practically pry my eyes open when my alarm went off. When I finally got my eyes open I saw that it was nearly as dark outside at 6:45 am as it was when I went to bed last night. Dark cloudy Mondays are always a tough start so I headed directly to the kitchen to brew some coffee. Can you believe this? I AM OUT OF COFFEE!! It is a terrible thing to try to start your week without coffee. Never fear I took the long way home from bringing Sasha to school and went through the coffee drive through. Since it is a gray cloudy raining morning and since I had to wait 2 1/2 hours longer than normal to get my coffee I treated myself to an extra shot of espresso. Watch out laundry piles I am going to conquer you today! Today’s recipe is truly decadent. 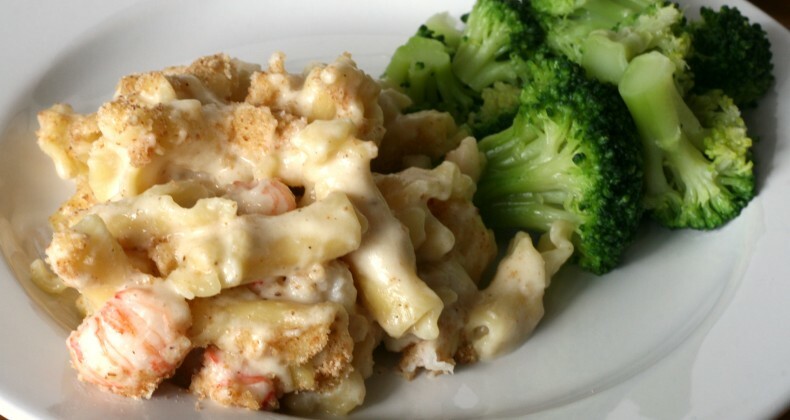 Creamy one pot macaroni and cheese with langostino tails topped with bread crumbs and baked in the oven. Sounds outrageous right? I think homemade macaroni and cheese is one of the best things. The blue box stuff? No thank you. I grew up with my mom making giant pots of creamy homemade macaroni and cheese. She used Velveeta and I am convinced that even though it isn’t gourmet cheese Velveeta melts into the best creamy cheesy cheese sauce ever. I have discovered a method of cooking macaroni and cheese, using real cheese, that has the same creamy results as using Velveeta. By cooking the pasta in the milk the starches from the pasta help create the perfect base for the cheese sauce. No roux needed here! A few years ago White On Rice Couple posted their one pot, stove top, creamy mac and cheese recipe and since then it has popped up everywhere. I first made it for aÂ barbecueÂ with friends then I made it again for Penelope’s birthday party. Neither situation was ideal for photographing it so I could share the recipe with you. Which meant I just *had* to make it again. Shucks! While at Trader Joe’s a couple weeks ago I noticed they had langostino tails in the freezer section. I picked up a bag and knewÂ immediatelyÂ how I would use them. Langostino isn’t a lobster it is called a squat lobster and is more closely related to a hermit crab. If you can’t find langostino feel free to substitute lobster tails, shrimp, or even scallops. My version takes one pot and one pan because I think macaroni and cheese should always be finished off in the oven. I love it when the cheese gets browned and bubbly. If you have any questions while making this there are a ton of help tips and hints on the White on Rice Couple’s post. Preheat oven to 350 degrees F. Grease a 9x12 casserole dish. Place dry pasta in a colander and rinse with water. Drain. In a large pot add pasta, milk, mustard powder, and Old Bay seasoning. Cook over medium heat. Bring the pasta/milk up to a simmer stirring frequently. Keep on stirring! This will separate the pasta and keep it from sticking. Once it is simmering turn it down to low. Keep watch so the milk mixture doesn't boil over. The pasta will continue to cook in the milk. If the temperature is too high the milk will evaporate too quickly not allowing the pasta to cook through. Keep on stirring! This will help the pasta cook evenly. It will take about 15-20 minutes for the pasta to cook and the milk to be mostly absorbed. If the pasta isn't fully cooked add a small amount of milk until the pasta is cooked through. Stir in the cheeses. Stirring until completely melted. Stir in the langostino tails. 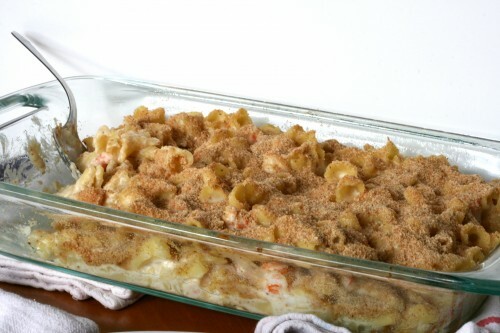 Pour the macaroni and cheese mixture into the prepared casserole dish and top with the toasted bread crumbs. Bake uncovered for 30-45 minutes. Serve with some steamed broccoli to balance out the ooey gooey cheesiness. Enjoy!